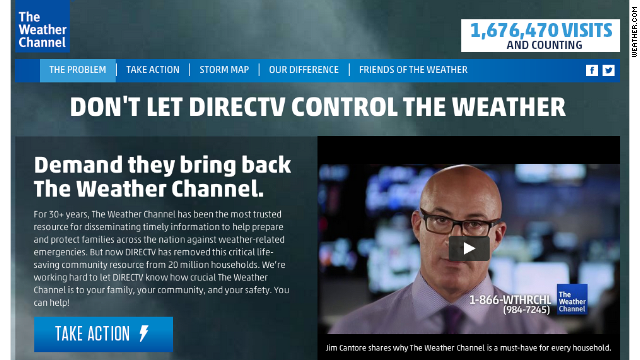 The ongoing blackout of the Weather Channel in DirecTV homes - affecting fully a sixth of all American households - exposes a challenge for television channels that carry weather, news and other types of information that are increasingly accessible on the Internet. The channels have to ensure that they're providing something the Internet can't - and that may be getting harder and harder to do. The weather channel is useless. I dont need to know the weather in New York I need to know the weather here. Which is why I use my cell phone to check the weather. I can get my local weather immediately. I would have to wait for the weather channel to finish reporting the most recent natural disaster and even then they don't report the weather on every city and town mine included. I have checked out Weather Nation. Not liking it.